Every dog deserves the security, shelter and shade provided by a quality dog house. Dog lovers know just how much their pets love to "den," and a dog house provides the perfect secure, personal space that dogs can make their own. Summertime heat and the chills of winter are both oppressive to dogs, and a dog house provides the perfect cool or cozy shelter from both. Pet Mountain knows that your dog deserves the best, and that you have to trust the home you choose for him. 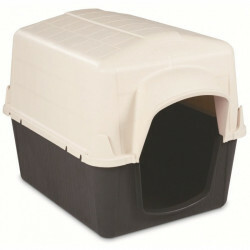 We carry only the finest houses from trusted manufacturers like Precision Pet and Petmate. Whether you're looking for a rustic, permanent house with real character, or a portable, efficient shelter, Pet Mountain has the house for you!